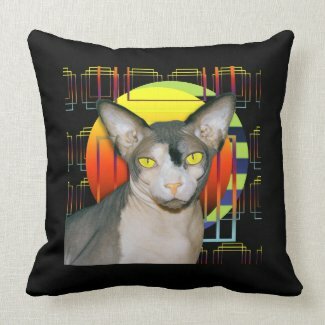 Sequin Dreams Studio: Zazzle Pillow "Sphynx Cat by Moonlight"
Zazzle Pillow "Sphynx Cat by Moonlight"
Zazzle custom made pillows are made in the USA with 100% grade A woven cotton and come in two sizes 20”x20” (square) and 13”x21” (lumbar). They have a hidden zipper enclosure with synthetic-filled insert included. They are easy to design using Zazzle's software. You can add as many images as you like to the pillow and re-size them to fit. If the images are too small to print zazzle's software will give you a warning sign. Here I've added a square shape photo of my Sphynx Cat Ninja, I've saturated the eyes to give a vampire look and added moon shapes in the background. This pillow is available at my zazzle store. Design you own pillow here. Love the pillow! You did a fantastic job!